Delhi University conducted Law Entrance exam namely DU LLB Entrance Exam stands out as a college especially among those law schools which are not covered under CLAT. The faculty are doyens in the field of law and the alumni include names of many legal luminaries. A 3 year LLB from DU might be the course for you when you are done with graduation and are looking to add to your qualifications in a big way. This document will give you all the information about the upcoming DU LLB exam and the admission procedure. If you have good analytical and researching skills, work ethic, tenacity and passion for the law then choose the law program by DU. 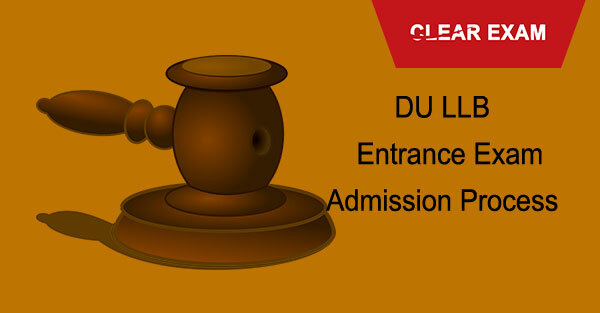 The DU LLB entrance is conducted every year by DU for entrance to the three colleges affiliated with the University. These three institutes are Campus law centre, Law Centre 1 and Law Centre 2. It is an offline exam and the pattern is multiple choice objective questions on topics studied till 12th standard. The total intake is 2611 and the seats will be filled on the basis of merit and ranks secured in the exam. The first step for you should be to check whether you are eligible to sit for the exam. There is conditions precedent such as the minimum qualifications although there is no age limit. You should be a graduate of DU or a recognized Indian or foreign university. The minimum aggregate marks obtained for General category students is 50 %, for OBC is 45% and for SC and ST students is 40%. There is no age limit for entrance in the DU LLB exam. The Application Form will be available online from the second week of May on the official portal of the university. The information to be filled in is your personal details such as name, and address and your education background. You have to also upload a scanned picture and a scanned copy of your signature. The application will be deemed incomplete without the payment of a small fee of Rs.500 for general candidates and Rs. 250 for reserved category candidates. The last date of submitting application forms is in the second week of May. Below is a list of all Important Dates which you need to remember for the DU LLB exam. Every year, a number of candidates appear for DU LLB Entrance Exam in the month of July 2018 and get the admissions into law colleges. DU conducts the entrance exam to offer admission to the interested and eligible candidates into law courses. Delhi University offers 3 years Bachelor degree in LLB. DU LLB Entrance Exam 2018 applications start in the month of May 2018. Delhi University will conduct the entrance exam in the month of July 2018. Read the post to know the complete details of DULLB 2018 Admission Process.